So you’ve chosen the perfect outdoor location for your next event. As we all know, the great outdoors with all of its beauty can also become unpredictable when it comes to weather. Here are a few tips to consider when deciding on a tent as you plan for your wedding or upcoming outdoor event. The type of surface on which you’d like to place tent will help determine what type of tent to use. Grass or asphalt surfaces are best suited for pole tents, which utilize stakes during the setup process to anchor them. Budget-wise, these are the more economical choice. For areas where stakes cannot be used, such as concrete, then frame tents or clear span tents are recommended. This type of tent is held in place with weights instead of stakes. 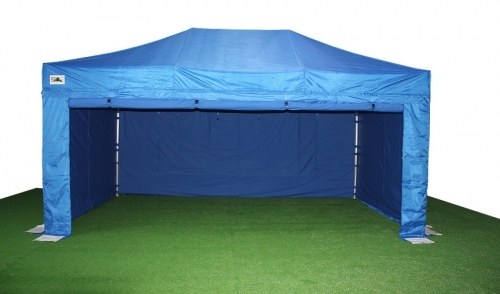 If you will be setting up your tent on grass, but your event requires an open interior space with no poles, then a frame or clear span tent would be the best choice since no interior poles are used. To help determine the size of your tent, there are a few things to keep in mind to help as you plan. What type of event is it? For example, weddings and other ceremonies generally require row seating. Do you know the maximum number of guests that could be there at one time? It’s always wise to plan for bad weather. If it rains, everybody will need to be able to get under cover. How will food and beverages be served? The size and shape of the beverage station, buffet tables and dining tables should be considered. A bar area requires approximately 100 sq. ft.
A food and beverage station requires 100 sq. ft. for every 50 people. 8 foot banquet tables require 10 sq. ft. per person for seated dining. 5 foot round tables require 12 sq. ft. per person for seated dining. Ceremony or row-style seating requires 7 sq. ft. per person. Using the above formulas can help you develop a good idea of the size and layout that you’ll need going forward. To help save space under the big top, consider using pop-up canopies for auxiliary beverage areas and gathering places. If possible, survey the proposed tent location during a rainy day. That way, you will be able to determine if there is a risk of water running through or puddling up where your tent will be. A level location is very important. Especially on grass, make sure there are no dips or holes. Because, as the sun goes down and lighting gets dim, there is increased risk that guests can stumble. Make sure all guests have an easy path of entry and exit through the tent. Bottle-necked areas can affect how smoothly an event runs and can even become a safety concern.